It's not every day that I don't get to use a camera that probably hasn't seen film in in for many many decades, so I think this deserves a quick post. 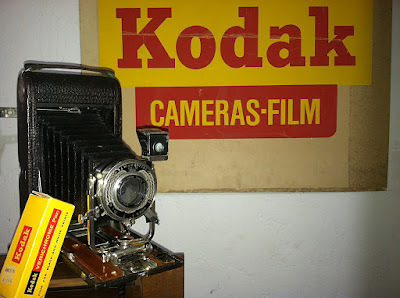 A few years ago I was in Duluth Minnesota and happened to acquire a few Kodak 3A cameras from an estate of a collector who has recently passed away. There were 5 of them and all but one were in great shape. Too bad, I thought to myself, that I will probably never get to use these babies since 122 size film has not been made since well before I was born. Recently I have seen some people use them to make tintypes, since you can literally put a plate right where the film used to go and you would have a 3.25x5.5in image without the need to for a larger camera. I thought about doing the same, but then felt bad as silver nitrate would surely corrode all the metal and bellows beyond repair. So I forgot about the stash of 3As in my closet until last week, when lo and behold someone on Facebook agreed to sell me 12 rolls of 122 film at a price I could not resist. So today was the day for the first roll to be burned and here is the prettiest of the 3As ready to be loaded. Kodak 3A cameras were produced between 1903 and 1915, so we can be sure that this one is over 100 years old by now. The reason I chose this one is because of the beautiful Volute shutter on it - those were an upgrade to the basic model and sold for quite a lot back then. The lens is a B&L Tessar f6.3. My choice of the prettiest shutter rather than the most reliable (ball-bearing) one might have turned out to be more vain than practical, but more about that a little later. 122 size film was produced from 1903 until 1970. Somewhere online I saw information that it was made until 1972, but that seems to contradict the writing on the seal that I found inside the package. 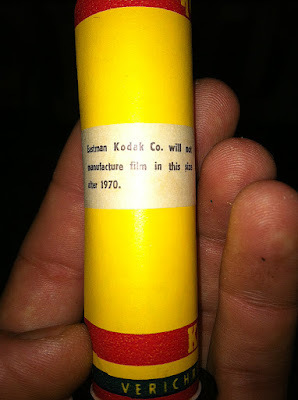 The film expired in December 1972 (the latest date in the batch I bought is summer 1973) and this is how the seal looked. A couple of days ago I thought about this - if I shoot this, how in the word would I develop film of this format since I don't have a spool for it?... Well, I dug around online and found a simple solution pictured below. Actually the guy who's entry I found made it a bit more complicated than my solution. His method is probably a bit more sturdy, but mine worked just as well and with minimal effort. What I did was this. 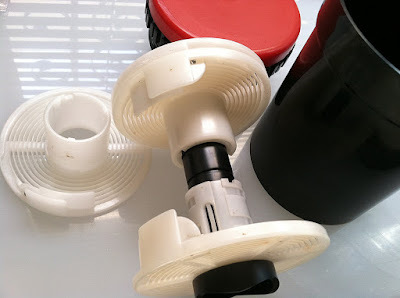 I took a double 35mm Patterson plastic developing tank (which somehow survived in my darkroom despite the fact that I loath those tanks and always use steel ones for my film) with two adjustable reels. Both reels were pulled apart. When that is done you end up with one half of the reel that fits nicely onto the central shaft and another one that has too big of an internal diameter. That's where the second spool came in handy - the skinnier half of that one was inserted into the wider one from the first set. In order to make them fit into the tank I had to break off those little flaps onto which the film is laid while loading. A happy surprise occurred when I took a 122 film spool to measure how far apart the reel halves would have to be - one of those notches on the central shaft made the top 'reel sandwich' stop at just the right spot for the width of 122 film! 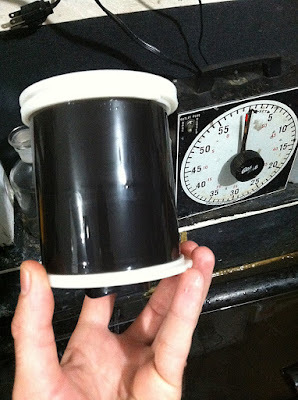 And so here it is - my simple solution for developing 122 film in a regular Patterson tank. I won't claim that the film went on there willingly... After 48-49 years of being tightly wound on a spool it was rather resistant to cooperation and it took a bit of cajoling and convincing. After a brief struggle it did oblige. I exposed this 125ISO film giving it about 1 stop more light than would be called for with fresh film. There's not too much to shoot around San Diego - lots of suburbia, beach (mostly less than picturesque), freeway, back alleys... And anyway I didn't want to try to find something extraordinary to shoot because I really didn't know how it would turn out. Development was normal for Verishrome - HC110, 68°F at 4.25min. 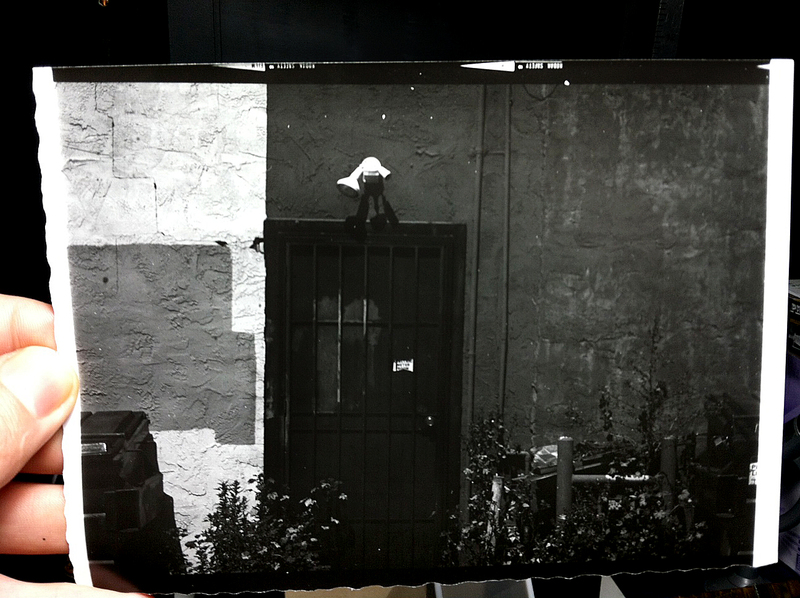 I was very happy to see that I had something on there when I pulled the film from the fixer. Unfortunately, when I went to hang it up to dry after a wash, I saw that the negatives were rather thin. I'm not sure why this happened. Development was obviously correct judging from the density of frame numbers and arrows that were pre-flashed there by Kodak. So my thinking is that the shutter was running a bit fast. Another theory would be that the film lost some sensitivity during decades of storage, but I'm less likely to believe that - I have shot Verichrome film dating back to the 60s with my Rolleiflex and have always gotten good negatives (although the amount of base fog varied according to age and conditions it was stored in). So, I think for the next roll of film I expose I'll chose another 3A. I will also make it a point to stop by our local camera repair shop and have them test the speeds on all of the shutters. They can give me a simple table of how those shutters behave at any given speed and also see if they behave consistently. Either way - there are the two shots I could pull out out of the 6 exposures possible. Printed using filter grade 5! Yeah, they're thin.... Nothing spectacular, but relatively exciting nonetheless seeing how it's likely that this camera has not been used in close to 100 years and knowing that the film was probably made in the year of Woodstock Music Festival! Oh, another quick note - the film dried a lot curlier than usual and so it's a good thing I have a 4x5 glass negative carrier. I know what you're going to say - those negatives are 5.5in long and so there's cropping involved! Well, first off this was just a test and I really didn't feel like firing up my 8x10 enlarger for these rather sorry-looking negatives. 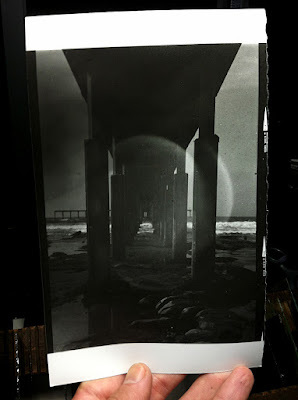 Secondly, when I do figure out exactly which of my cameras gives me best possible results and have some decent negatives I will actually print them the way they were meant to be printed - as contact prints on AZO paper. Thanks for reading this or at least skimming through the pictures! It's fairly easy to put spacers into new rolls of 120 film and use them in a 3A. 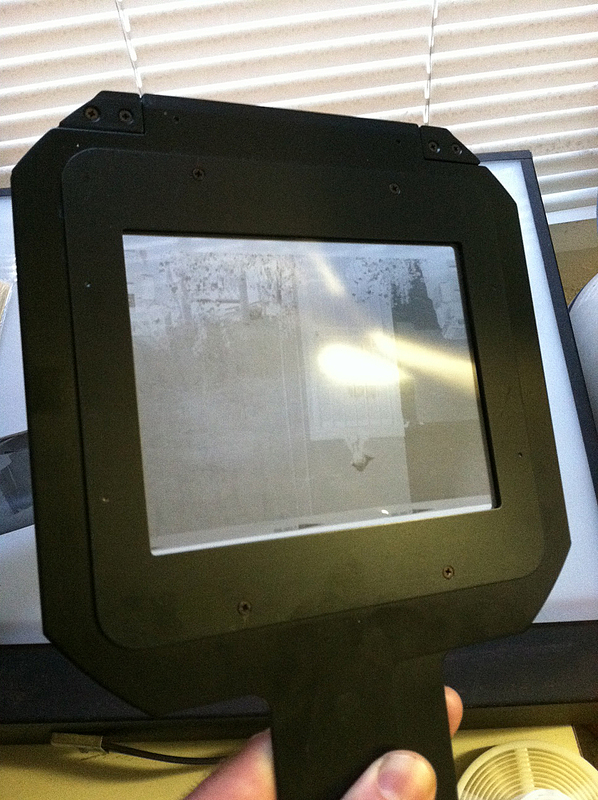 The results are 2 1/4 x 5 1/2 inch panoramic negatives. True too. However then you don't know the spacing of frames and the film will be curling into the frame window thus out of focal plane. Very well done. Though we can improvise many things for 122 cameras, there is nothing like shooting it as it was intended. Do you have any print scans to get a better look at the results? Thanks Adam, I too think that there's something special about using equipment for exactly what it was meant to be used. I have no scans of these - these test shots were NOT AT ALL scan-worthy. I mean the negatives were so thin I could barely make an image out of them and what I got was so far below my personal standard that as I type this they are resting in a garbage bin. I promise to add a section to this blog entry in a week or two after going over to the local camera repair place, testing the shutters on my other 3As, figuring out which one is closest to true printed speeds and shooting a couple more rolls on more interesting subjects. Oh, and at that point they still won't be presented from scans - I don't have a scanner and usually for good online copy I just use a copy stand and a good lens on a 5DII. I just had a roll of 122 film brought into my lab in Gosford Australia it was found in an old camera that belonged to his grandfather i am excited to process it.